This is a difficult recipe to get right. I first came across it on my trip to Georgia, the ex-Soviet state, last year. One of the culinary discoveries I enjoyed most was Khachapuri, a kind of pizza, but which contained very salty cheese called Sulguni. 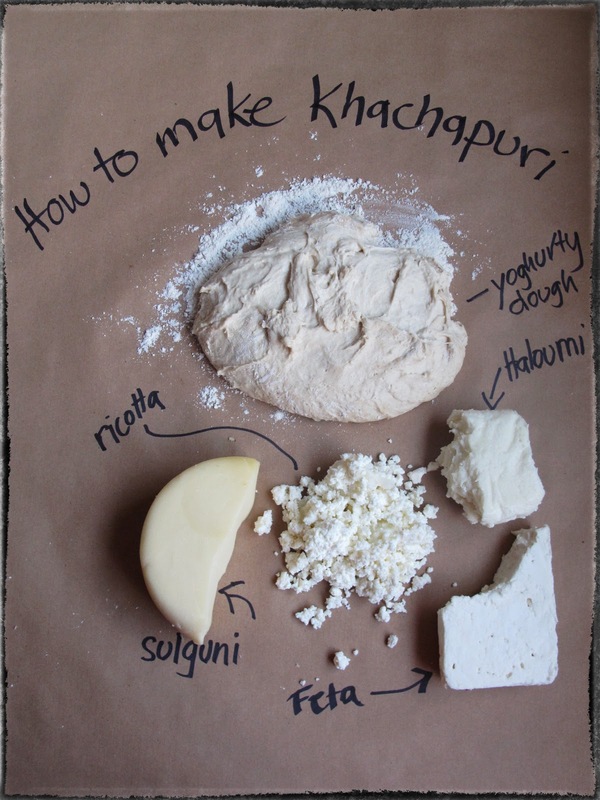 Khacha is Georgian for cheese and puri is derived from the Sanskrit for bread, just as a ‘puri’ is a puffy bread in Indian cooking. Myself and Helen of Food Stories were both on this trip. We’ve been mulling it over… where to get Sulguni? How do we make khachapuri when we don’t have a tandoori style oven? Which is the best recipe? 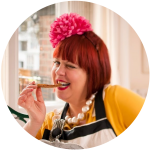 Yes, these are the things about which food bloggers lay awake at night, fretting. Another thing that happened in Georgia, on the dusty trails lurching from kvevri to kvevri, was… love! Our Helen met our Donald, a ferociously gifted wine blogger (I’m channelling Cilla here). They both like to party and the rest is history. They are now living together, a formidable team. Love in the blogosphere. Helen and I have since been searching for convincing recipes. Part of the problem was nowhere in the UK sold Sulguni. The award-winning book The Georgian Feast contained a couple of disappointing recipes that just didn’t seem right. The author suggested using Danish Havarti cheese and Muenster, which was just wrong. Had she even been to Georgia, we wondered? I tried another recipe from the New York Times, which wasn’t right either, lacking the yoghurt in the dough, which gives it the desired slightly sour taste. 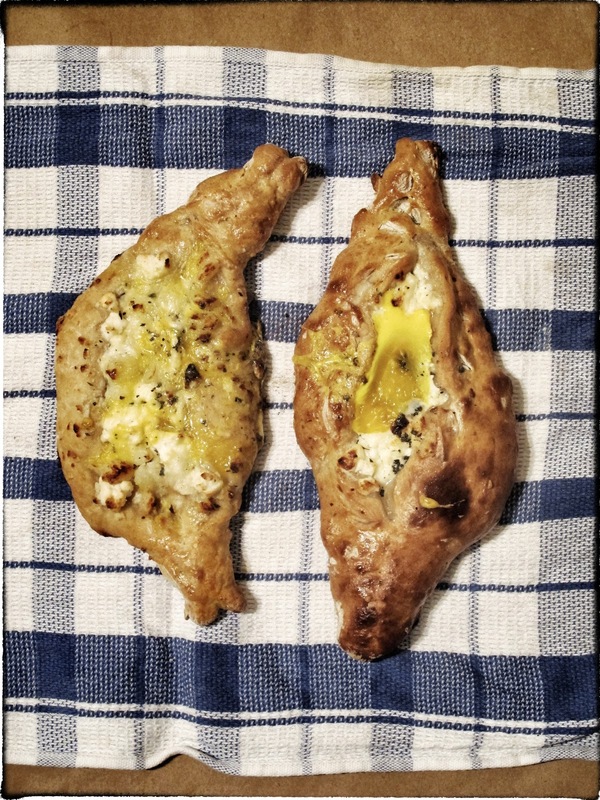 Then Jerusalem, the book by Ottolenghi, came out, with a recipe for khachapuri. There is a sizeable Jewish population in Georgia, some of whom emigrated to Israel. (The food in Israel is excellent, being influenced by the Jewish diaspora, ie: everywhere.) Khachapuri is a popular snack in Israel, hence its inclusion in ‘Jerusalem’. So Donald, Helen and Chris Pople came over. Helen even found Sulguni in a Bayswater shop! Donald bought a kalashnikov of Armenian brandy! We all decided it was the moment to taste every bizarro dairy product you have ever seen in Eastern European shops but were too scared to ask. You know that glass of white stuff called ‘Puck’? It’s basically Dairylea but saltier therefore nicer. There are two main types of Khachapuri: circular and boat/fish shaped. The ‘fish’ shape is reputed to be related to Christianity. 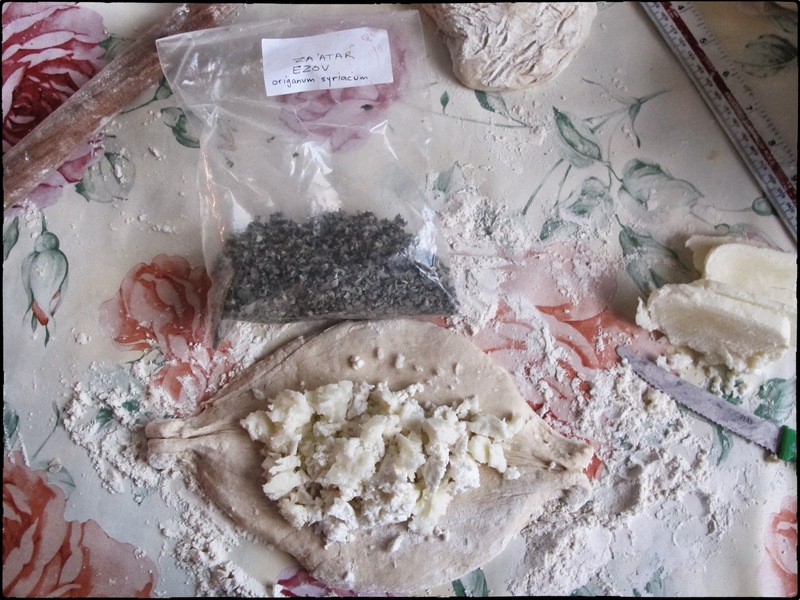 In Tbilisi we were given the circular Khachapuri, ‘megruli’, filled and topped with cheese. In other parts of Georgia, you can have ‘Ajarian’ Khachapuri, which is sometimes topped with an egg. Despite the Bayswater Sulguni being the ‘real’ thing, it didn’t seem salty enough. One wants a stretchy mozzarella type cheese with a high salt content. Ottolenghi’s solution of a mixture of feta, ricotta and halloumi did taste very authentic. However I disagree with one aspect of his recipe: brushing the dough with egg before baking. It wasn’t like that in Georgia, in fact the circular version had almost a thin flakey dough encasing the very salty cheese. So it’s still not right but we are getting there! You know I’ve stopped sifting flour, I just give it a good stirring with a fork or a few twirls in the food mixer. Most flour nowadays doesn’t have lumps and really they ask you to sift it so that it gets air in it. Less washing up! Anyway, don’t bother sifting the flour, into a bowl, add the yeast, egg, yoghurt, water, then the salt. (Try not to let the salt touch the yeast before mixing, it slows down the rising, so Ottolenghi says to pour the liquid ingredients into a well and sprinkle the salt around the rim.) Mix it all together, cover and leave to rise. It’s quite a slow rise. At least 2 or 3 hours. Divide the dough into three parts, rolling each part out into a circle 16cms in diameter (on a floury surface der!). Then stretch each end out into a boat shape. Shove the cheese mixture in the middle and try to close up the sides so it doesn’t fall out. Right, really important: preheat your oven up to as high as it will go. You want its maximum temperature, probably about 250ºC. I’ve recently treated myself to a peel so I floured that lightly and carefully moved the khachapuri boats onto the peel. Then, because my technique is not yet that great, I managed to move the boats onto the floor of the hottest oven of my Aga. 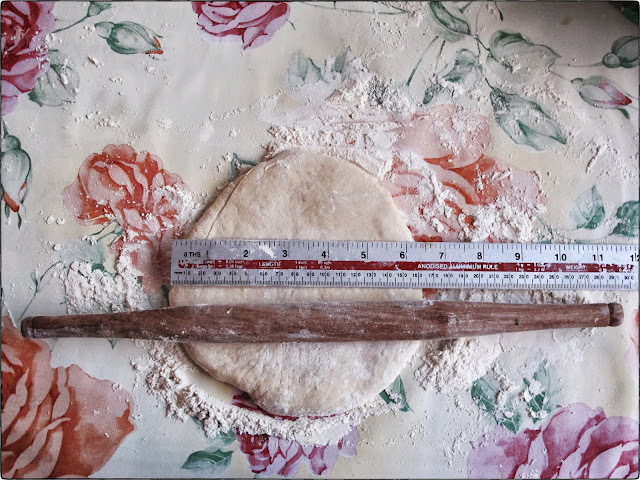 With an ordinary oven, use either a pizza stone, a bit of marble, or a preheated flat baking tray. You want that heat on the bottom, so don’t put it onto a cold tray, you want to seal the bottom. It takes about 15 minutes to cook. Have a look, see whether it’s golden and puffy. You can break an egg into the boat as a topping if you like, then return the khachapuri into the oven for another five minutes. Eat with a tarragon and walnut salad, that’s very Georgian. Such dedication! I admire your determination to recreate a dish you have enjoyed on your travels. I got "Jerusalem" for Christmas too. Lovely book, full of inspirational ideas. See my blogpost about Open Kibbeh, being published later this afternoon! These look absolutely fantastic. I love cheese with bread and will be trying this recipe very soon. oh my god. I just drooled savagely. Impressed by your dedication to getting the end result spot on. Finding a way to get to Georgia this year motivated by your posts and Helen's. Very inspired to make this – the egg on top version. Although can't agree that Puck is anything but…muck. Looks lovely. Did you try Nigella Lawson's version? I made that and thought it was delicious but I've never tried an authentic one to compare! The name of the cheese is spelled wrong. It's suluguni (That's what I remember from visiting Georgia, and it's right there on the label in your picture – written in cyrillic). I bought them from my local Kurdish shop Where2Save which sells many Polish products. 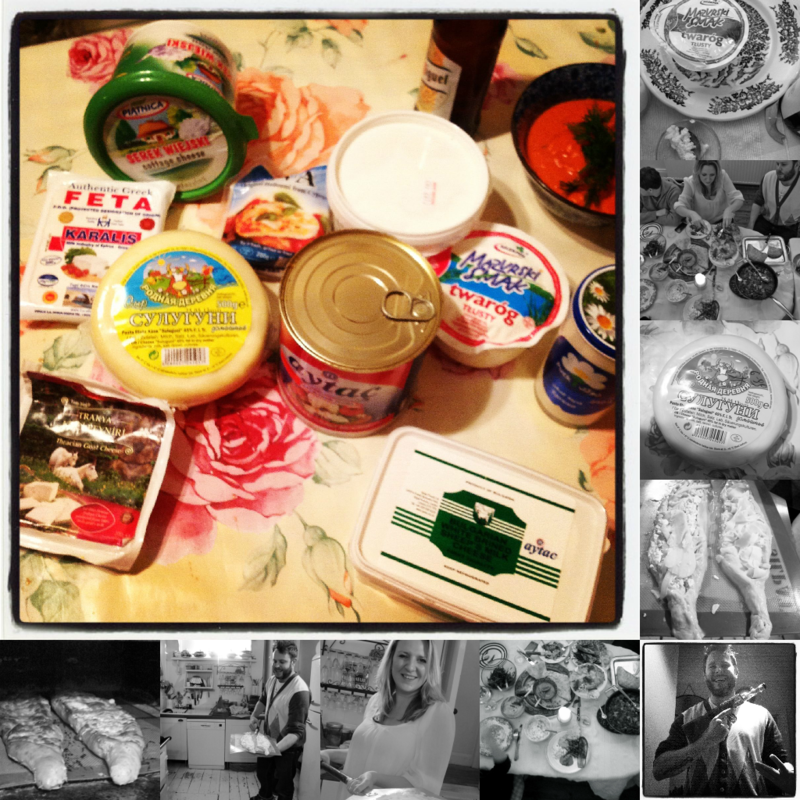 We were just trying everything to imitate the sulguni cheese from Georgia.